This DRK8080 system is fully assembled and is ready to use. This WiFi 802.11 wireless mobile animated head system offers full wireless, multimedia, sensing and motion capabilities and comes with wide range of sensor, camera, and audio modules. The system runs on wheel based platform with rotary sensors mounted on each wheel to precisely measure and control wheel movement. 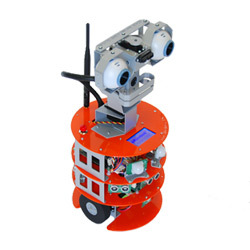 The mobile animated head system has total of 7 degree of freedom, 5 for the upper head and 2 for the mobile platform. The eyes can pan and tilt, eye cover and mouth can close and open independently, and the neck can pan and tilt too. This system is fully integrated and tested. The technology behind such system evolved from Dr Robot’s Distributed Computation Robotic Architecture which was originally developed for Dr Robot Humanoid Robot. Through the integrated high bandwidth (11Mbps) WiFi 802.11 wireless module, the system can upload all the sensor information including the rotary sensor readings to your home PC at over 20Hz rate and streams audio (8Hz x 8bits) and video (up to 4 fps) to your home PC for your high level AI schemes to process. Your control commands are sent down to this mobile system at real-time via the same wireless link at a rate of 10-50Hz. With the supplied WiRobot development software components (for MS Windows 2000 and up), you get access to all these data information in standard Microsoft Windows programming environment (e.g. MS VB and VC++). With such approach, you have no limit on mobile system processing power, memory and storage any more. For users of non-Windows operating systems (e.g., Linux), Dr Robot will provide the raw communication protocol for direct integration with any other system/device. With such system, you could develop your own intelligent robotic assistant, security robot or simply use it as a platform for your projects like human-machine interaction, mobile system navigation, robot behavior, image processing, object recognition, voice recognition, tele-operation, remote sensing, map building and localization etc.